Work in progress around the 2012 Olympic fence at Stratford. Londoners flocked to East London where next year's Olympics are to be held at Stratford. But the crowds went not to admire the almost complete stadium a km away. This was the opening day of the Westfield Stratford shopping mall, situated on the fringe of the 2012 Olympic park andWestfield hosted its first day to thousands of shoppers eager to see Europe's largest urban shopping centre. The £1.45bn complex houses more than 300 shops, 70 restaurants, a 14-screen cinema, three hotels, a bowling alley and the UK's largest casino. It will provide the main access to the Olympic park for the 2012 Games and a central 'street' will give 75% of Olympic visitors access to the main stadium so retail space and so far 95% of the centre has been let. It is claimed that up to 8,500 permanent jobs will be created by the retail sector. 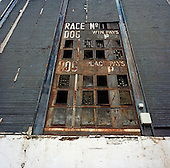 The old greyhound and speedway track in Hackney Wick, east London. The stadium opened in 1932. By 1994 a £12M stand and restaurant was built and the stadium was renamed the London Stadium, Hackney. In December 1997 the company that owned the stadium, London Stadium Hackney Ltd. went out of business and the Stadium was left derelict for several years until it was bought by the London Development Agency and demolished in 2003. The site is now to be used as part of London's Olympic Stadium site in 2012. According to a report in The Observer newspaper on 9 December 2007, it will host the new Olympic media and broadcast centre, and, after the Games, will be turned over for commercial use. On the day after the end of the London 2012 Paralympics, thousands lined the capital's streets to honour 800 of TeamGB's athletes and Paralympians. Britain's golden generation of athletes in turn said thank you to its Olympic followers, paying tribute to London and a wider Britain as up to a million people lined the streets to celebrate the 'greatest ever' sporting summer and billed to be the biggest sporting celebration ever seen in the UK.